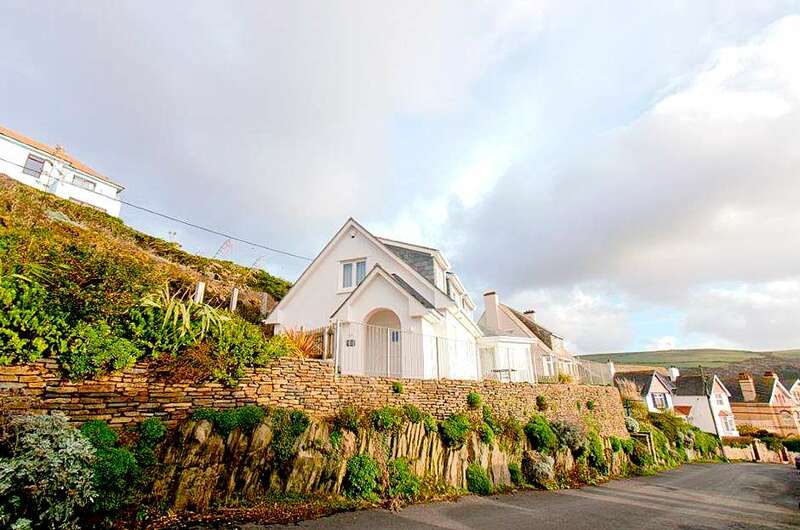 Situated on a lovely corner plot just up Rockfield Road behind Little Beach is the stunning architecturally designed detached chalet bungalow called Bayview Cottage. What a position! Not only does it have breathtaking views from most rooms but it is so close to the beach and village at Woolacombe. With three bedrooms it can accommodate 5/6 comfortably with the 6th person using the single guest bed which comes out from under the other bed and stands at the same height next to it. On the outside the house has balustrades patios terraces running around the front and side which are ideal for outdoor dining, sunbathing and BBQs. The front door leads to an inner lobby with cloakroom with WC and hand basin and opposite to a large utility room with freezer, washing machine, separate tumble dryer, sink and storage cupboards. Off this room is a large wet room shower, absolutely perfect for coming off the beach or washing down sandy dogs or feet. The back door also leads straight into this room as well so surf boards can be left in the shed securely, you can go straight into the shower and all without having to enter the main part of the house at all. The kitchen is rather splendid with solid black granite worktops over white gloss units; Neff appliances include an induction hob, range cooker, double combi oven, warming drawer, microwave, dishwasher and fridge. The dining table seats 6. My favourite room is the living room with its huge floor to ceiling folding doors opening on to the terraces and really taking in the full view over the beach and sea. There are 2 and 3 seater white leather sofas, 2 big comfy swivel chairs in the bay, large flat screen HD Freeview TV, PS3/DVD, surround sound, Wii, Music CD player and Wi-Fi. In the sideboard are games, cds, books and DVDs. The focal point for the evening is the lovely wood burner. Once upstairs there is a large double with en-suite shower,WC and basin, wardrobe, chest of drawers and great sea views. Another double bedroom with hanging hooks, chest of drawers and sea views along with a further single/twin bedroom again with a lovely sea view. Both share a family bathroom. This family bathroom is opposite with spa corner bath and hand shower attachment. Facilities include travel cot, parking for 2/3 cars, dogs welcome at £20 per dog per holiday, opening stairgate at bottom of stairs as dogs not allowed upstairs please, shed for board storage and garden furniture, BBQ. A £200 security deposit is held and released after the holiday. Bayview Cottage is bound to appeal to families and couples at all times of the year and with all this going for it will surely become a firm favourite for Holiday Home Hunters regulars so best to book early.